The modeled Bangladesh Wind Dataset created with the Weather Research and Forecasting (WRF) model (www.wrf-model.org) contains data simulated between 12:00 AM UTC on 1 Jun 2014 and 23:00 PM UTC on 29 Dec 2017. Observational data (surface reports, radio-soundings, aircraft reports and satellite winds) from NCAR's ADP historical database, as well as nine local observation stations maintained by NREL, were assimilated with the Four-Dimensional Data Assimilation (FDDA) algorithm. CFSR data were used as boundary and initial conditions. The spatial resolution of the dataset is 3 km. 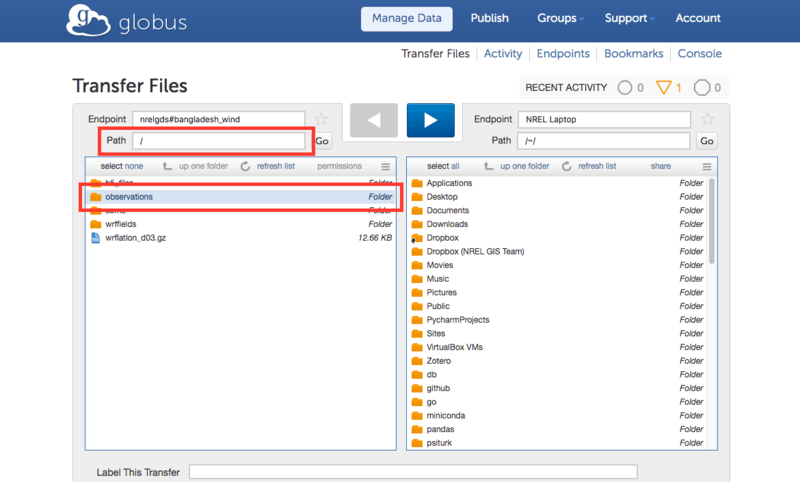 Below is a description of the downloadable data directories available via the Globus client. Each variable is 8760 rows long, each row consisting of values for 71,145 sites. 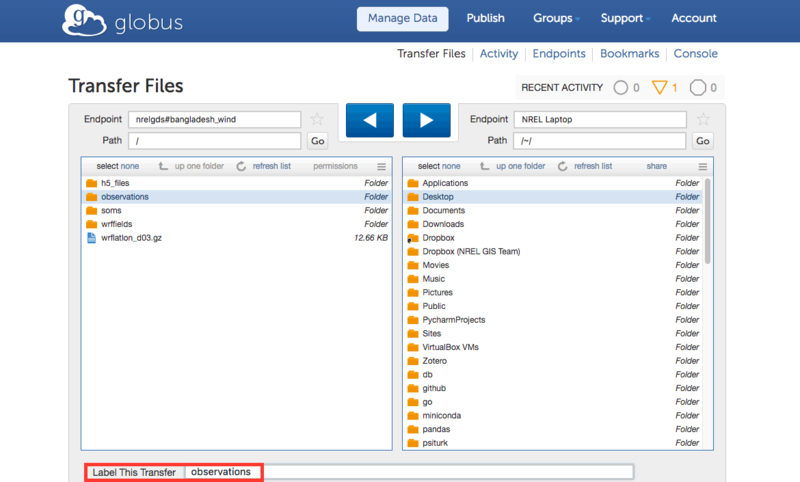 Site metadata can be referenced in the meta variable. Moreover, for each variable, null data values are captured in a fill_value attribute, integer scale factors in a scale_factor attibute, and units in a units attribute. These are the files resulting from the extension of 3-year simulations to 15 years to create a long-term reference. The six identified regimes were downscaled with the WRF model down to 3-km grid spacing for the month of July. This directory contains the raw WRF output data. This is a file containing latitude and longitude information about the grid points in the raw WRF output files from the wrffields directory. 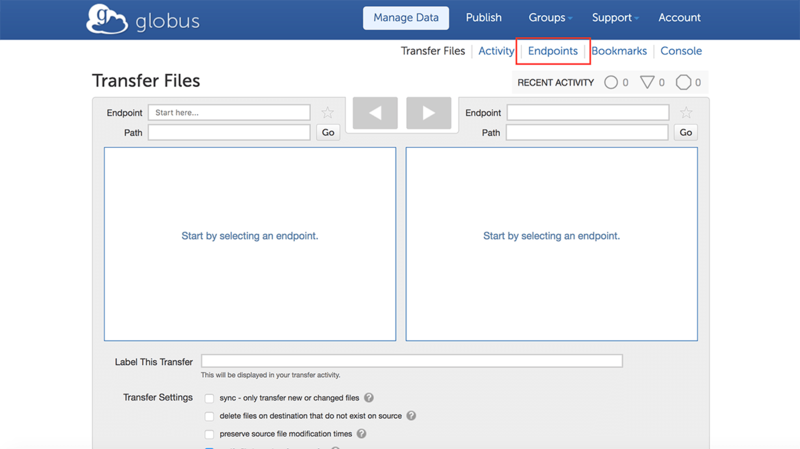 You'll need a Globus, Google, or ORCiD iD account to transfer data to your local machine. 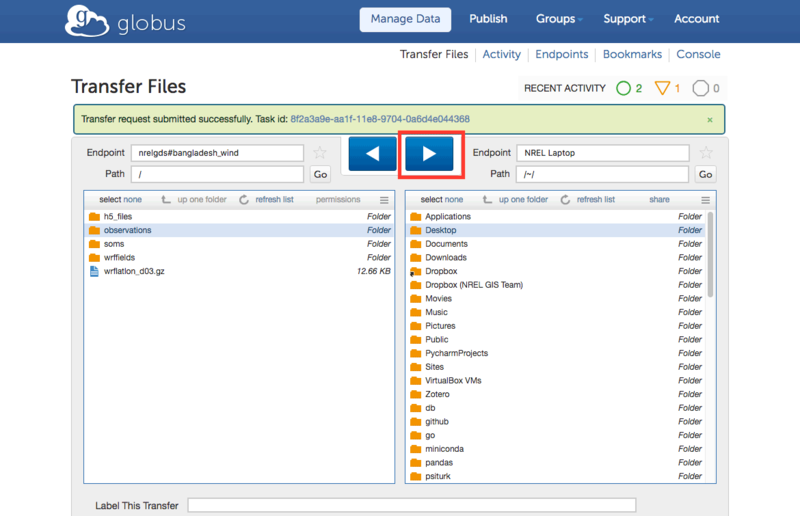 To create a Globus account, visit https://www.globusid.org/create. Also, note you'll also need to install software locally if you have not used Globus before. More information on this can be found in step 2 below. Visit https://www.globus.org/, then log in with your preferred credentials. 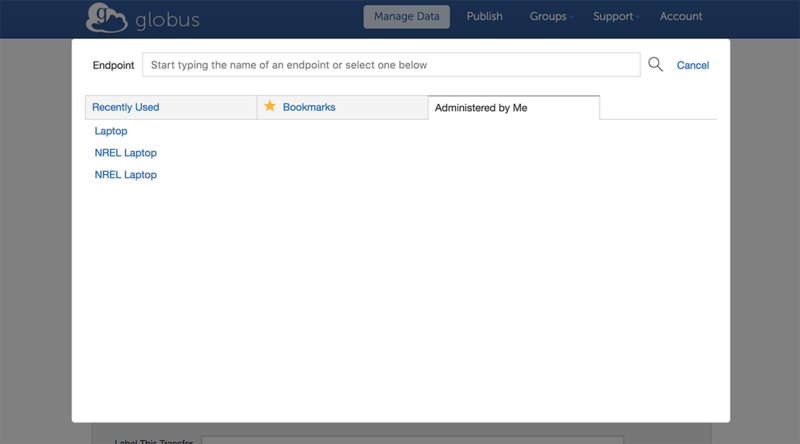 If you have not already done so, add your local machine as a Globus Connect Personal endpoint. Choose the appropriate software to install on your local machine. Note: Once the install is complete you'll need the Setup Key to activate the endpoint. In the left-most Endpoint window, search for and add nrelgds#bangladesh_wind. You'll now have access to the data directories described above. In the right-most Endpoint window, search for your local endpoint. It may be found under the Administered By Me tab. 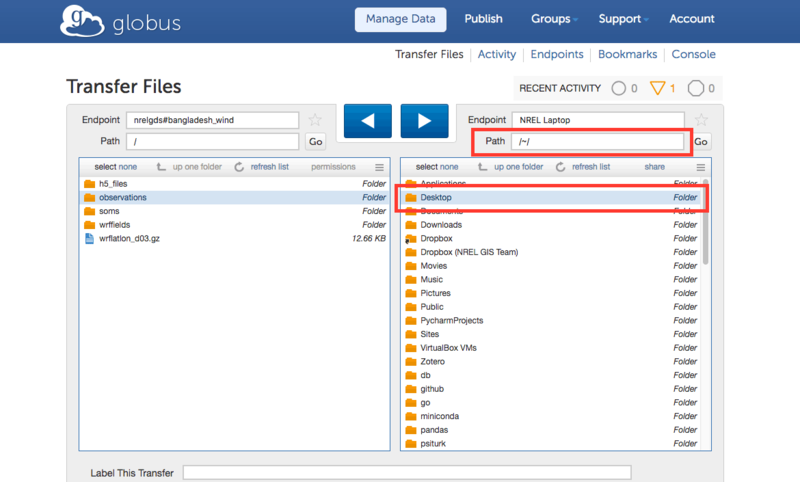 Select the data Path to the left that you will transfer from Globus. Select the destination Path for the data on your local machine to the right. Below the Transfer windows, provide a label for the transfer. 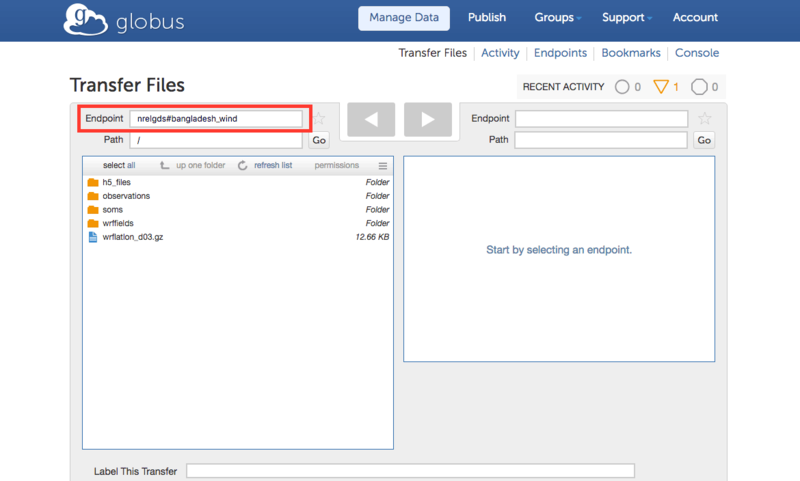 Click the right-most arrow at the top of the page to begin the transfer.